Anyway, it’s finals week for me and I have a big project going on at work, so when I went grocery shopping on Sunday I made a point to put together some quick and easy meals. I already had a bunch of veggies in my kitchen from all the big elaborate meals I thought up and “didn’t get to” this week, so with an additional carton of veggie broth and 1 can of beans I was able to make up this soup. Besides clearing out my fridge, it came out pretty tasty. Sometimes it pays to throw in everything but the kitchen sink and see what happens. 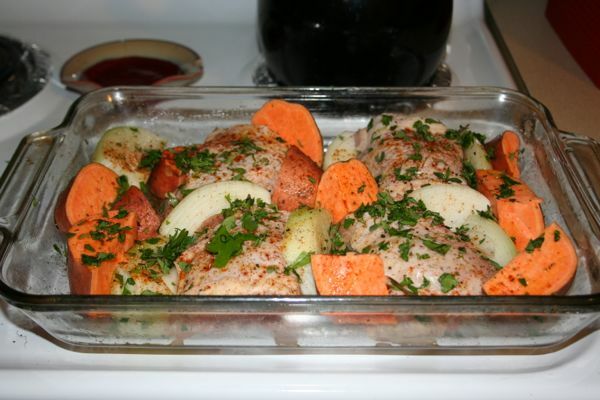 Preheat the oven to 375 F. Cut the sweet potato and parsnips into 1/2 inch cubes, and lay on a greased baking sheet. Drizzle with olive oil, sprinkle with salt and pepper, and roast for 30 minutes. Turn the pieces over half way. Since the veggies will cook a bit more in the soup, they don’t have to be completely cooked through. Watch them and make sure to remove them from the oven before they start crisping. In a large sauce pan, heat a bit of olive oil and saute the onions and celery on med-low flame until translucent, about 5 minutes. Try to keep them from browning. Add in the rest of your ingredients, except the beans, and bring to a slow boil. Once boiling, add beans and reduce heat. Simmer, covered, for another 20 minutes. Top with fresh parmesan to serve. I happened to have some amazing kielbasa in the fridge homemade by a friend of mine in the fridge (thanks Kathrin and Sam! 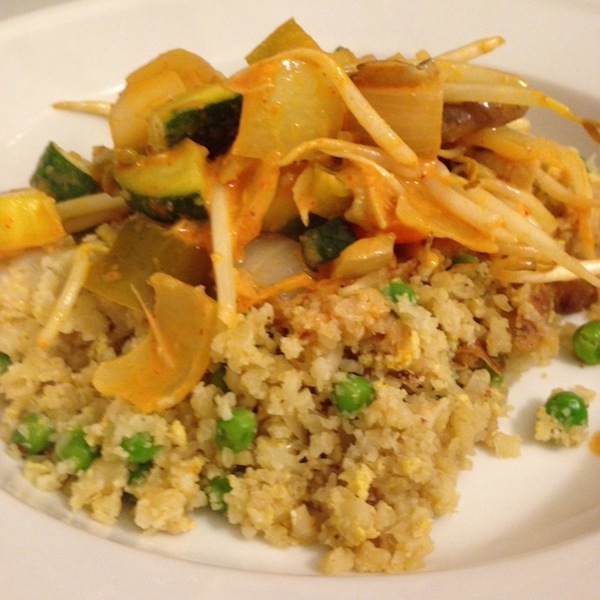 ), so we sliced that up and threw it in the leftovers for something different. It was refreshing and satisfying both ways. When I was planting my new window garden, I had to trim a few of the herbs down so they would fit. 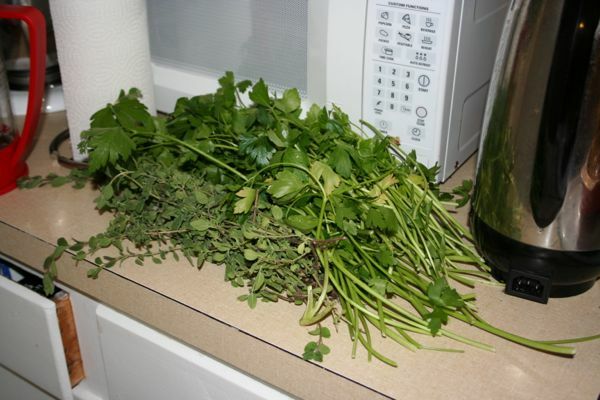 This left me with a big bunch of fresh cut herbs just begging to be to chopped up and rubbed on something. 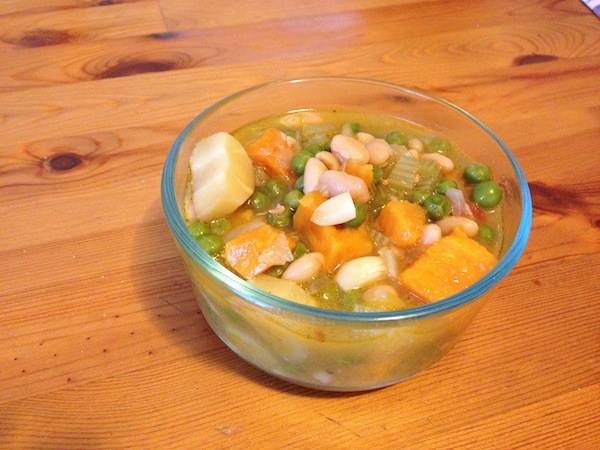 This dish normally calls for white potatoes, but I subbed in sweet potatoes because I already had some in the house. Very tasty both ways! Cut the sweet potatoes, skin on, into 1-2″ chunks. Cut the onion into quarters or sixths. Rinse each piece of chicken under cold water and pat dry. I use chicken with the skin on for extra flavor when cooking and so nothing dries out. If you don’t want to eat the skin you can always toss it later. Drizzle a little olive oil in the bottom of your baking dish. Arrange the chicken with space in between to fit in the veggies. Then spread the sweet potatoes and onions around in between the chicken. If it doesn’t all fit in one pan, arrange in two smaller pans. Drizzle the top with olive oil. Sprinkle with salt, pepper and paprika. Then finish with chopped herbs. Cover tightly and bake for 45 min to 1 hour. Uncover for the last 15 minutes so chicken can brown. In my excitement to eat, I forgot to take a picture of the finished dish when it came out of the oven. Sorry! This year we finished up our annual day of tomato canning with over 100 jars of crushed perfection. Alas, no matter how many we make, it’s never enough to last through the year. You’d think we were dealing with gold bars the way everyone in my family gets all greedy and stealth-like when dividing up the shares. I kid you not when I say I have had to smuggle jars out of my house to share with friends, and even my grandmother. It’s never pretty, but that’s just how treasure is. So, until my allotment runs out, I’ll be feasting on my favorite meals and not rationing properly at all. Of course, all my favorites start with tomato sauce. *Store bought canned tomatoes often contain citric acid and other additives. Because tomatoes are naturally quite acidic, they stay well preserved without additives. Look for a brand that contains just tomatoes, or tomatoes and fresh basil. In a large, deep sauce pot heat a few tablespoons of extra virgin olive oil on med-low. I use a deep pot because the sauce doesn’t lose as much water while cooking and ends up with a better consistency. 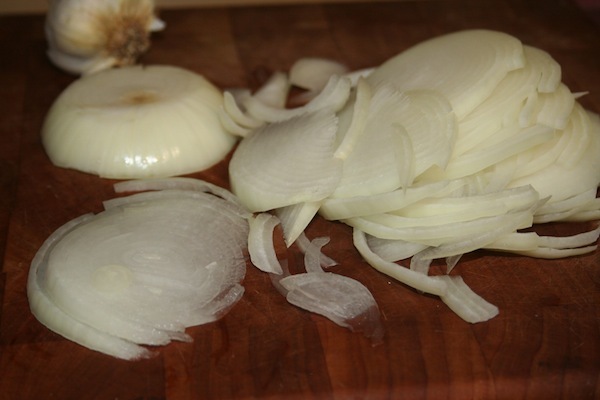 While it’s heating, slice your onion as thinly as possible. 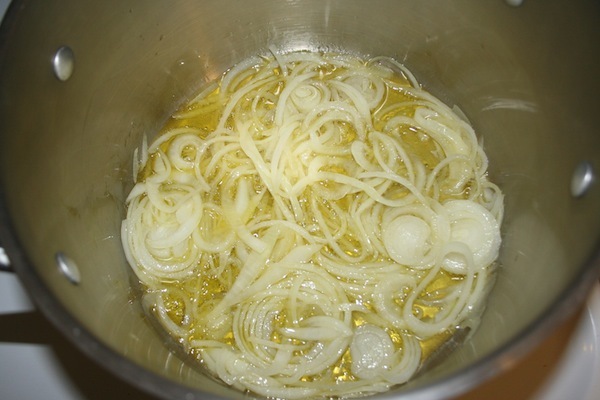 When the oil is nice and hot, add onions and allow them to caramelize on low for 5-10 minutes. Make sure that they do not start to brown. Once the onions are translucent, add in your tomatoes. Here’s a tip: pour the tomatoes over the back of a wooden spoon to keep from splattering yourself. Turn up the heat and bring everything to a slow boil. Then, reduce the heat to low and simmer. Stir in in the garlic cloves, basil and a pinch or two of salt. Simmer on low, covered, for at least 45 minutes. If you have the time, you can let it cook for longer. Stir every 15-20 minutes with a wooden spoon. 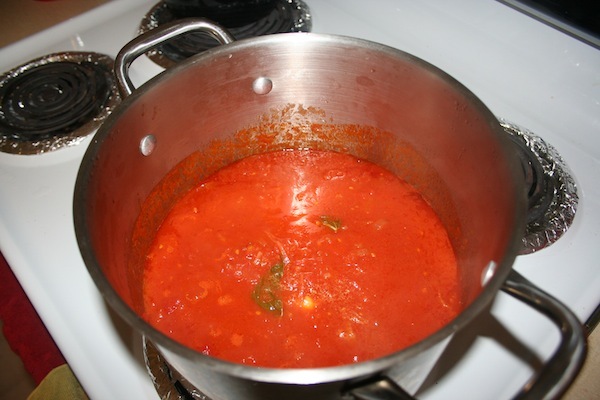 During the last 15 minutes of cooking, remove the lid to allow the sauce to thicken up. Taste again and add more salt if necessary. 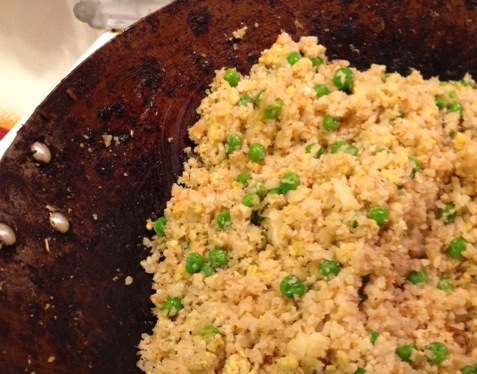 Freeze the unused portion for quick weeknight meals.